Northall offer a range of Gift and Coaching Vouchers which make the ideal Birthday or Christmas presents (or indeed business gifts) and can be redeemed at the club for shooting, cartridges and catering. Voucher Sales There are 7 products. 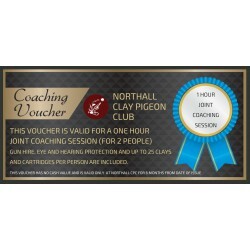 This voucher is valid for a period of six (6) months from date of issue and can be used against any shooting or coaching at Northall.